The Detroit Zoological Society (DZS) has provided regular programming for children at local hospitals for a number of years. The monthly, hands-on activities provide a welcome distraction from short or long hospital stays as young patients receive treatment at both Beaumont Children’s Hospital in Royal Oak and Detroit Medical Center Children’s Hospital of Michigan in Detroit. With a goal of reaching as many pediatric patients as possible, and thanks to generous donations from DZS guests, staff and volunteers, we are sharing a new experience with these children that is filling hospital activity rooms with smiling faces. This interactive experience allows them to step into the role of a veterinarian or wildlife conservationist. 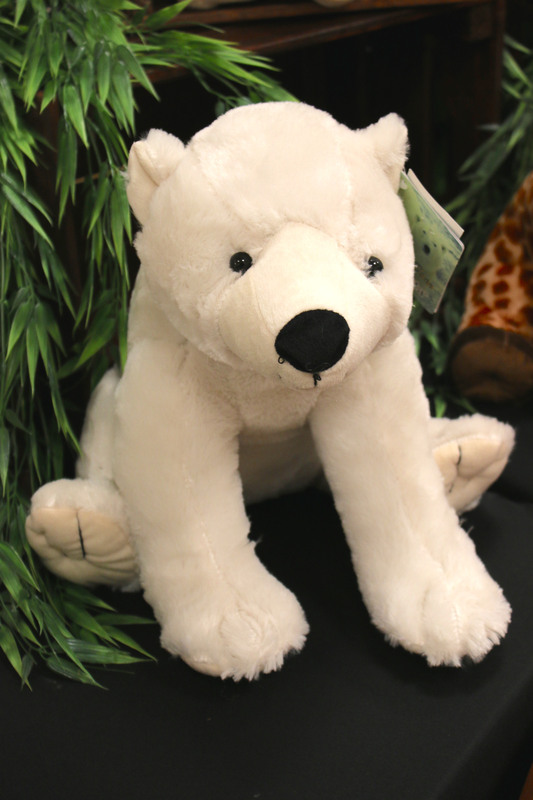 As children enter the room, they have the opportunity to choose and “adopt” a plush animal. 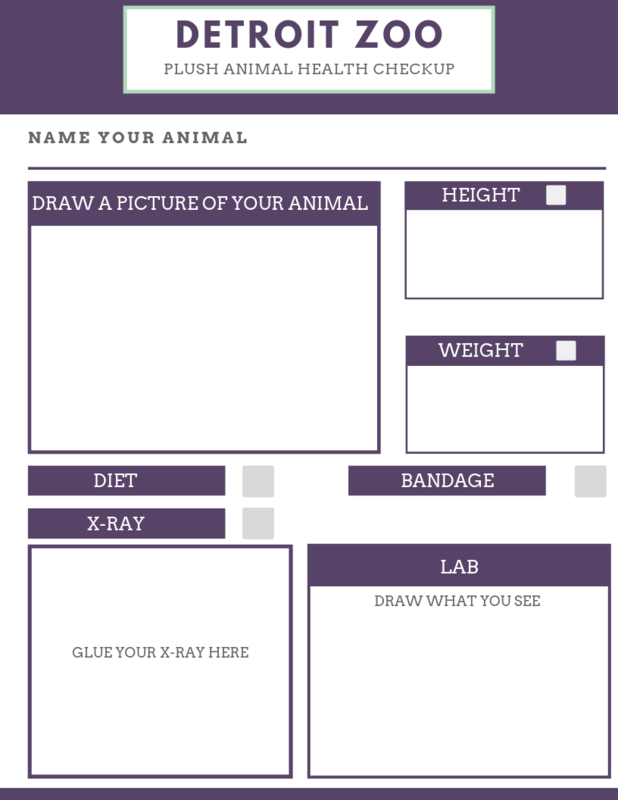 They take the animal through a series of health check-ups, including weighing, measuring, food preparation and X-ray review, carefully charting the information they collect. At the end of the examination, the child is able to keep the plush animal as a forever friend. The stations are intentionally designed to be flexible and meet the diverse needs of each child. If a patient does not want to or is unable to move from station to station, the activities can be easily brought to them. The experience can be shortened or lengthened depending on the interest and stamina of each child. The activities can also be made more challenging for older children or simplified for younger patients. The process of completing the animals’ health check-ups provides an opportunity for hospital staff to communicate with patients about their own treatment. Physical therapy and patient aide staff are also able to take advantage of these activities to help patients move from station to station. 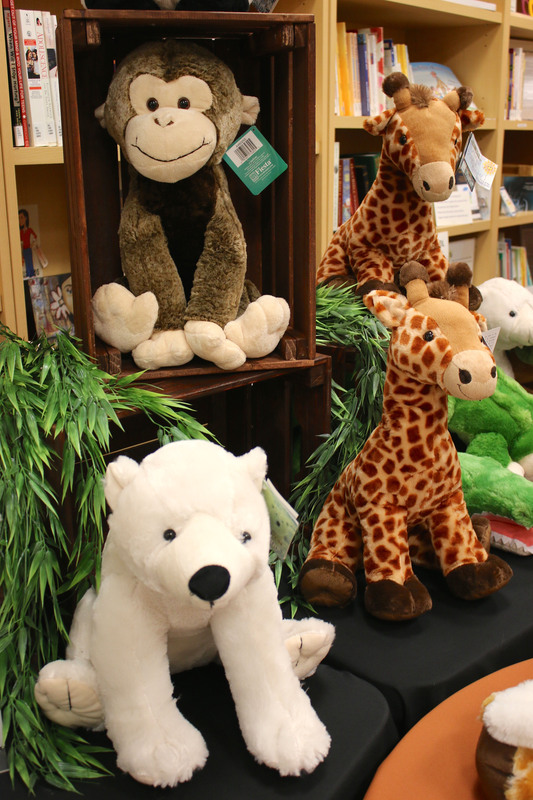 The plush animals have been available for purchase at a discounted price in the Detroit Zoo’s gift shop, Zoofari Market, since 2014. The philanthropic idea was the brainchild of employees of Service Systems Associates, which operates the Zoo’s concessions and retail services. Our pediatric hospital programs are creating memorable moments for children during their hospital stays, which can be a difficult time for many. Because of those who have so generously donated to this program, we are able to make a real difference in their lives. 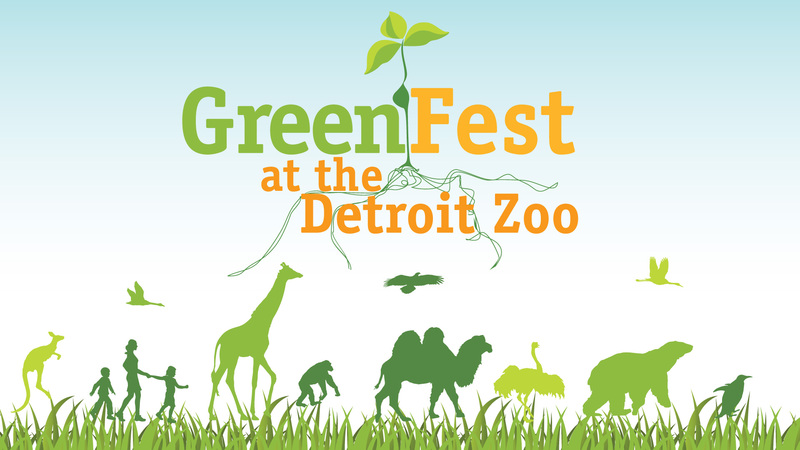 – Carla Van Kampen is a curator of education for the Detroit Zoological Society. 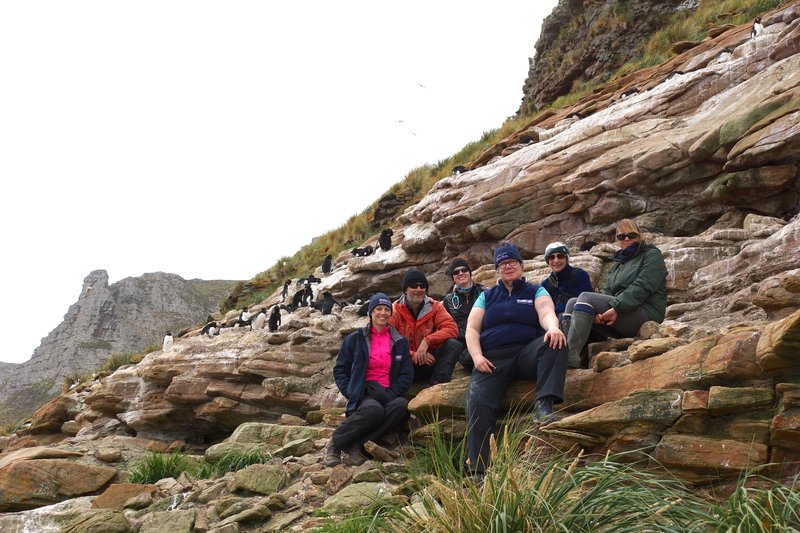 This is Part II of a series about a recent conservation expedition to the Falkland Islands by the Detroit Zoological Society to understand the threats facing populations of wild penguins and seabirds. For Part I, click here. Conducting scientific research in the Falkland Islands can be logistically challenging. Located 300 miles to the east off the southern tip of South America, this remote territory consists of two main islands and several hundred smaller islands dotting the South Atlantic. Some of these islands have rocky cliffs at the ocean’s edge. Others are completely inaccessible. With this said, the Falkland Islands provide critical habitats for several species of penguins, seabirds and other wildlife, and such fieldwork is necessary to preserve these populations and understand the risks they face. Threats are looming from oil extraction and increasing ecotourism in the area. The Detroit Zoological Society (DZS) was asked by a partner organization called Falklands Conservation to develop a project that would explore the impacts of infectious disease, pollution and tourism on these populations. After months of preparation, a DZS veterinary team embarked on the mission. Traveling to the Falklands from Detroit is a 50-hour journey. First, you fly to Atlanta and then to Santiago, Chile. 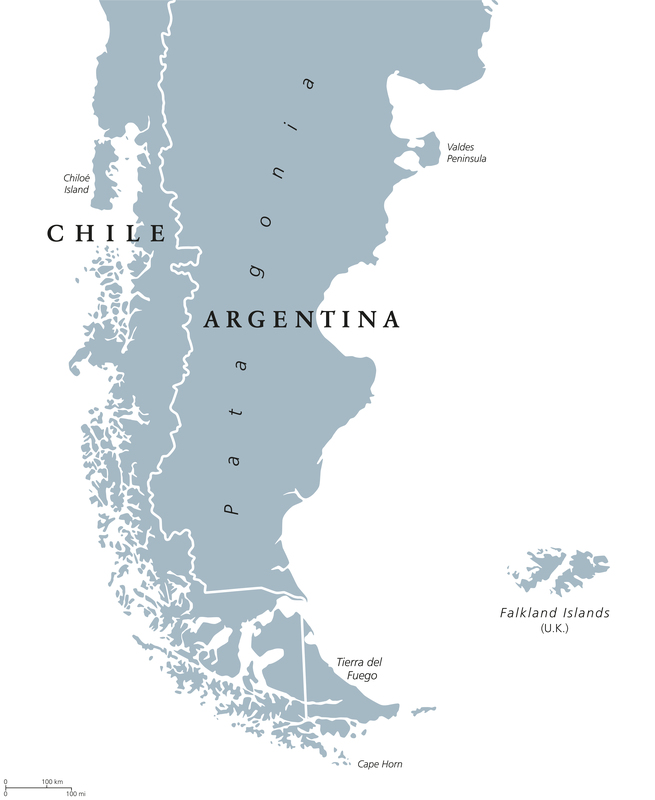 The next day, you fly to Punta Arenas, Chile and then continue on to Stanley, the largest city in the Falklands. Stanley has a population of roughly 2,000 people, and about 900 people live elsewhere in the islands. By comparison, there are approximately 450,000 sheep spread over the islands, which amounts to more than 150 sheep per human. There is also an estimated 800 miles of coastline in the Falklands, which is home to four species of penguins and numerous other seabirds. 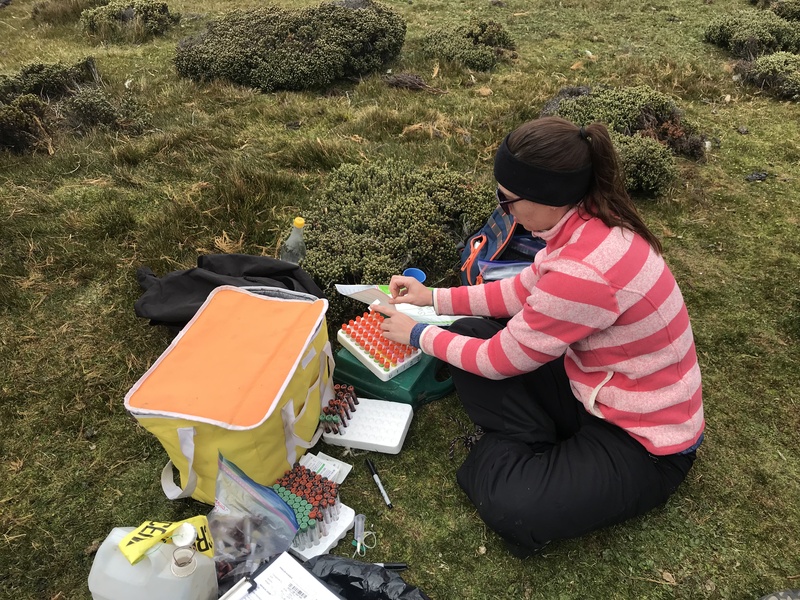 The DZS’s goal was to take blood and feather samples from penguins living in different locations within the Falkland Islands. Some had experienced the presence of humans, industrial shipping and oil activity and others were far removed from these potential impacts. The team also set out to examine two penguin species, one that tends to forage closer to land and one that travels far out to sea. The research team’s home base for the expedition was a 55-foot sailboat. Each morning, the team would pack supplies into backpacks, get dropped off on an island and hike to various penguin colonies to collect the samples over an eight-hour period. One day, the team was set up on a beach near a gentoo colony and the next was spent on rocky cliff near a rockhopper colony. Each penguin was handled for less than 10 minutes, during which time the team conducted a physical exam, took swabs to test for viruses and bacteria, collected blood and used scissors to trim a few feathers for toxicology testing. Afterward, each of the penguins went right back to their colonies and continued their regular activities of grooming and socializing. 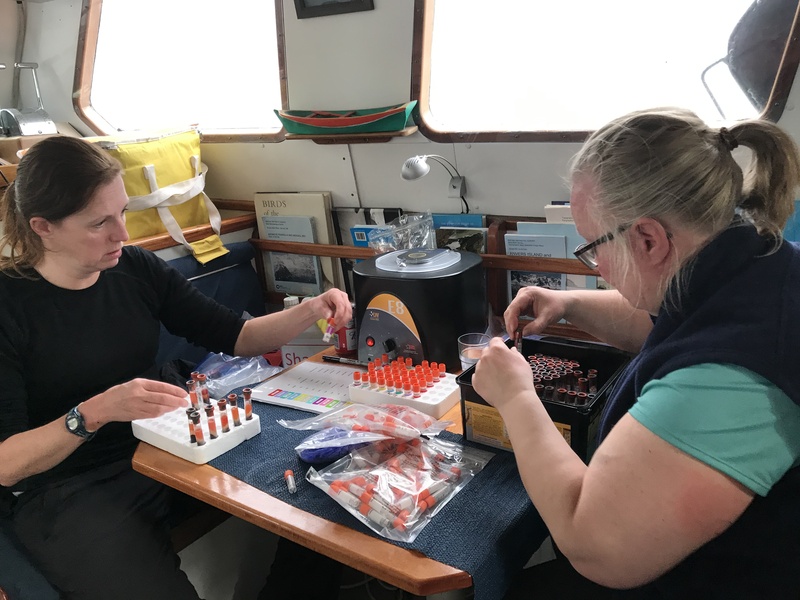 In the evenings, our researchers took over every surface of the boat and spent three or four hours centrifuging the blood, making slides and getting samples ready for storage in liquid nitrogen tanks for preservation until our return to Michigan. In all, the team examined 95 penguins. Our hope is that we can better understand the current health status of these penguins as well as the impacts disease and exposure to environmental toxins and humans may have on wildlife. Ultimately, measures could be taken in this region to ensure important marine habitats – and the wildlife who rely on them – are protected. The days may be shorter, the weather colder, and our lives might be spent mostly indoors during this time of the year, but it can still be a valuable, educational time for families. 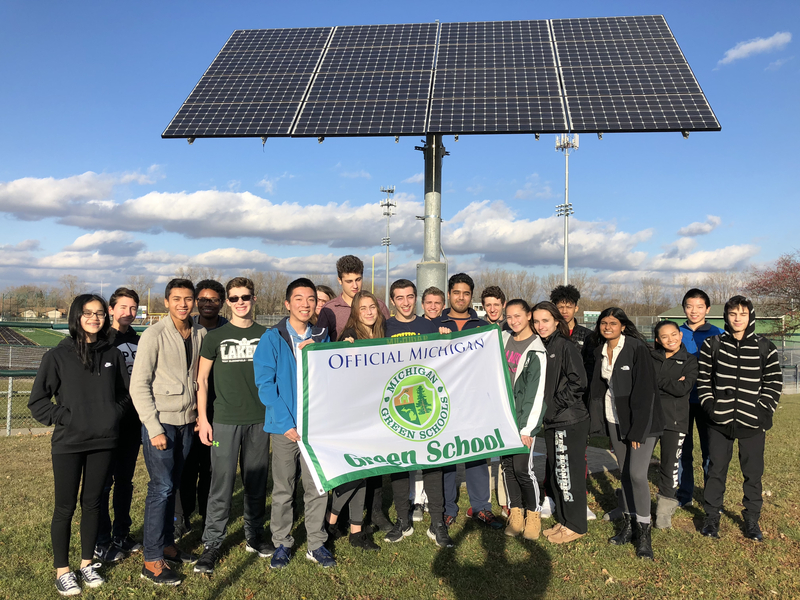 There are a number of activities we can do with our children to follow and support the Detroit Zoological Society’s humane education goals of fostering empathy for others and developing respect for wildlife and wild places. Empathy is the ability to understand another person or animal’s experience from their perspective. It’s being able to place yourself in some else’s shoes/paws and mirror what they are feeling which, in turn, is known to increase positive social behaviors. While it can be innate for some of us, empathy is actually a learned behavior. One way to help nurture empathy in children is through stories, which can help them process thoughts and information. Stories allow us to put on different hats, try out new experiences, think through future actions and develop our moral compass – all of which can be done from the comfort of our own home. We do this in a number of our humane education programs offered by the Detroit Zoological Society. We share experiences of people helping animals and books that enable us to explore the world around us from an animal’s perspective. Even after a story has been read, there’s still an opportunity to continue building empathy by taking action. 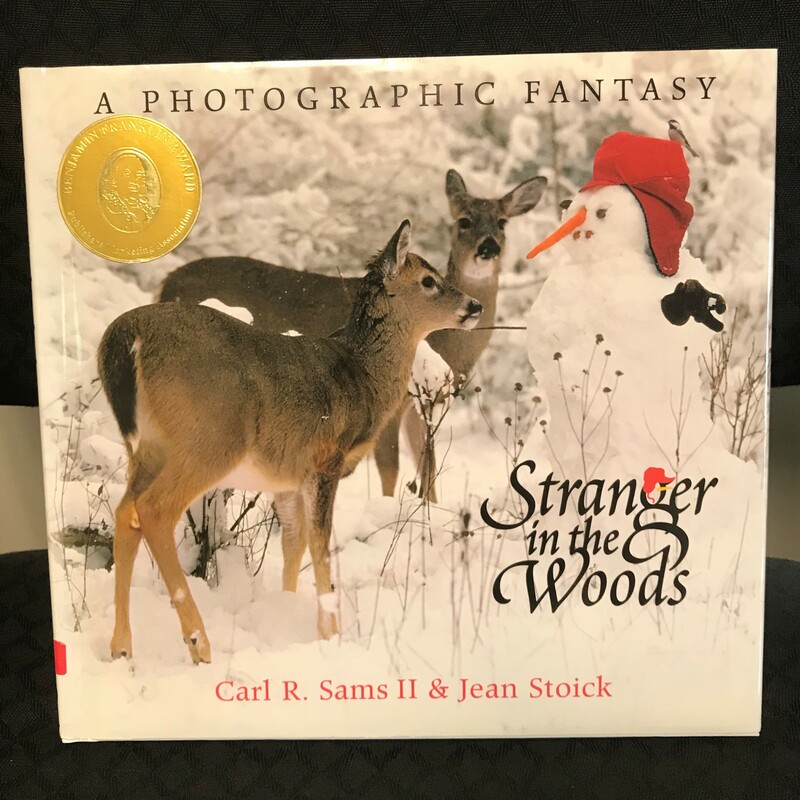 For example, you could read “Stranger in the Woods”, a beautiful picture book about local wildlife, and then build a wildlife-friendly snowperson by incorporating decorations that can feed animals. Examples include a carrot nose, potato eyes, a birdseed scarf, etc. 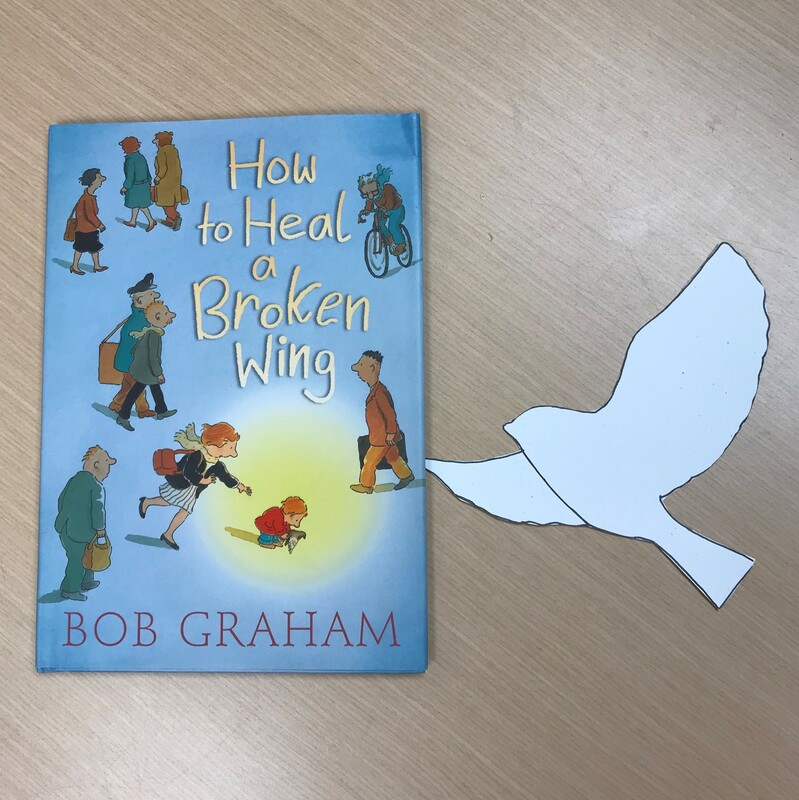 After reading “How to Heal a Broken Wing”, a book about helping an injured bird who flew into a window, you could make window decals to prevent bird collisions. You could also learn how to humanely deter ants from your home after reading “Hey Little Ant”, a book that sheds light on an ant’s perspective. Fostering empathy in children can start at a young age. Together, we can help instill values of walking softly and treating the Earth’s creatures gently. While Valentine’s Day is usually a sea of pink and red, let’s add some green to our celebrations this year. Date nights and gifts that show your significant other how much you care can easily include a little love shown to the Earth as well. 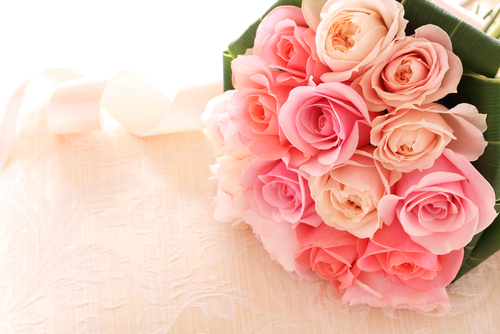 Options abound for eco-friendly ways to revel in the romance. Date Night. Embrace the weather and spend time in nature by bundling up and heading outside. Go skiing, ice skating, find a local winter festival, or head to the Detroit Zoo with your significant otter for a Valentine’s Day date. Cook at home. Some restaurants require reservations weeks in advance. Instead of hitting the town, cook dinner together at home using locally sourced food. It’s a fun activity that’s more intimate than being surrounded by other couples; plus, it will save you money. Finding fresh ingredients can be challenging during Michigan winters, but a trip to your local farmers’ market could produce everything you need. Many vegetables are ripe this time of year in their extended season, including onions, potatoes and carrots – learn more about what grows when in this handy guide. Get creative in the kitchen by finding recipes incorporating these in-season foods. And don’t forget about maple syrup! It’s a delicious staple of Michigan’s agriculture industry and can be tapped as early as February. This can make for a delicious breakfast in bed for your partner. Skip the pricey wrapping paper – instead, reduce, reuse and recycle! Reduce the cost of wrapping paper by purchasing reusable gift bags. Reuse your cookie tins and jars to present a gift instead of cardboard boxes. Recycle old newspapers and magazines as a sustainable alternative to fancy paper. And for this category, let’s add another “R” – romance. 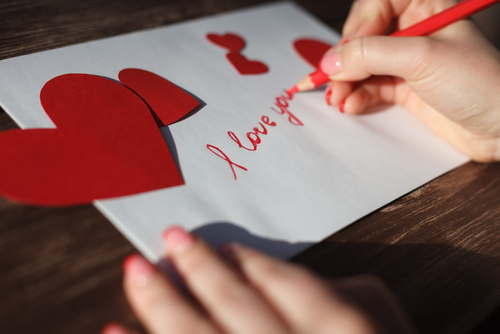 A hand-written card can be more sentimental than a store-bought greeting card. Crafts for children. Children’s arts and crafts can be good for the environment too. Skip the messy glitter and make a heart-shaped bird feeder! It’s a fun craft to do together while fostering respect for wildlife and providing food for birds. Other options for home-made gifts for the young people in your life rather than pricey presents include friendship bracelets made out of colorful yarn or snow globes made out of recycled baby food containers. There are countless creative ways we can demonstrate our devotion to each other and to the Earth on Valentine’s Day. Love is in the air, so let’s keep the air clean and safe for all of us who share this planet. The Detroit Zoological Society (DZS) has a long history of leadership in the areas of penguin conservation and penguin health. 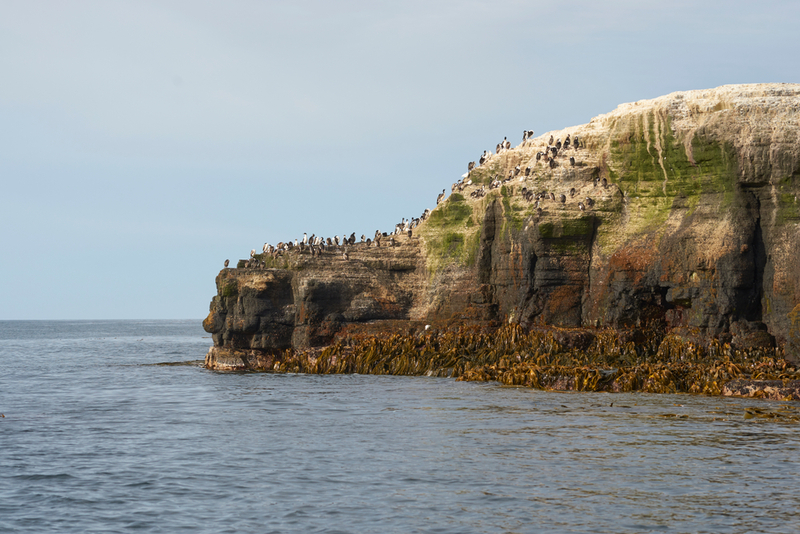 In recent years, we have been collaborating with Falklands Conservation (FC), an organization working to understand the threats impacting wild penguin and sea bird populations in the Falkland Islands. In early 2018, the DZS was asked to develop a project that would explore the impacts of infectious disease, pollution and tourism on these populations. 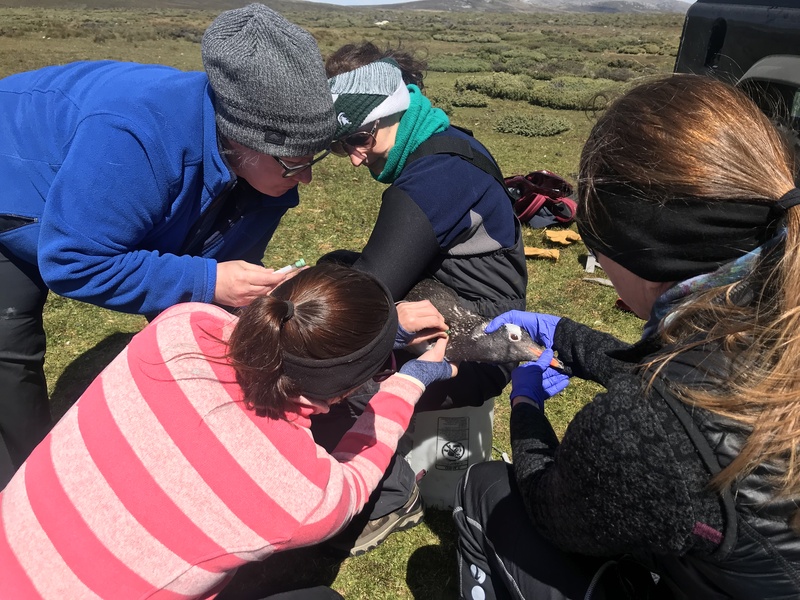 When monitoring birds as part of their study, the folks with FC often noticed sick penguins, but they didn’t have the resources locally to investigate the causes of this illness. The DZS has incredible expertise in the areas of penguin health, handling, behavior and welfare. We also practice compassionate conservation, so we knew we could develop field techniques that would minimize the amount of handling required as well as the stress it may cause the animals. And so began the most comprehensive study of the health and welfare of a wild population of animals the DZS has ever undertaken. During the next eight months, we reached out to dozens of veterinarians, virologists, bacteriologists, toxicologists, welfare scientists and conservationists who were working on projects with similar goals in wild penguins, though not quite as comprehensive as ours. These conversations provided us with valuable information that helped inform our own project. We also discovered that over the past 5-10 years, testing has advanced in ways that would allow many unanswered questions to be investigated. With the right partners and execution, we had an opportunity to do some important work, and to tackle some of the goals that had been recently established by the International Union for the Conservation of Nature, the world’s leader in the conservation of plants and animals. To meet the project goals, we would be sending samples to four different laboratories and gathering as much information as possible within the scope of our resources. We would focus on new testing capabilities and our strengths as leaders in animal welfare. For example, at the Detroit Zoo’s Polk Penguin Conservation Center, we’ve discovered that a particular blood test is often more useful for identifying penguins fighting infection or toxicological problems than the more traditional ones used for other species. We also planned to use a test that looks for the DNA of germs causing disease, which prior research did not include and would strengthen the science considerably. Lastly, we are fortunate to have developed an on-site endocrinology lab at the Detroit Zoo, specializing in the science of animal welfare. 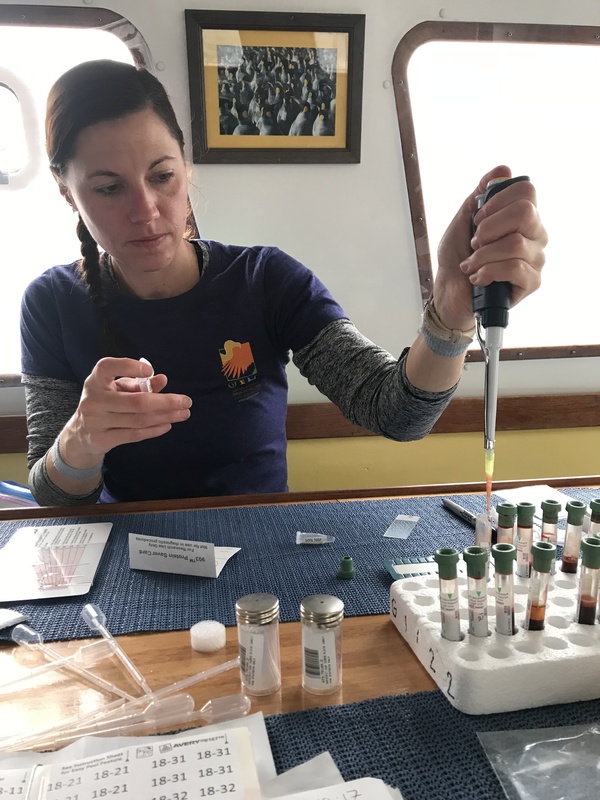 Our team at the Center for Zoo and Aquarium Animal Welfare and Ethics has incorporated cutting-edge testing to measure the potential impacts of disease and exposure to environmental toxins and humans by measuring stress hormones and damage to DNA, which has been linked to chronic stress. Once we had our “to do” list, it was time to plan the logistics. The Falkland Islands are extremely remote; therefore, conducting this research was going to have its challenges. We would be collecting and storing samples on beaches and rock ledges, far from the hospital setting we are used to at the Detroit Zoo’s Ruth Roby Glancy Animal Health Complex. Stay tuned for more details about this incredible project in an upcoming blog entry. – Dr. Ann Duncan, Director of Animal Health for the Detroit Zoological Society and oversees the Ruth Roby Glancy Animal Health Complex.